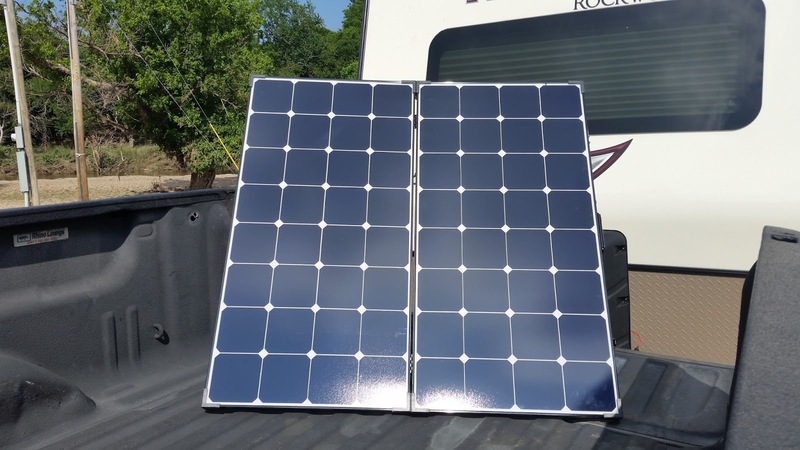 Readers of this blog will recall that I made the decision to attach solar panels to the roof of the camper by drilling holes into it and affixing the panels with screws. This design worked great and I didn't have a single problem with the Tank's passive solar setup the whole four years it existed but, having traded in my solar power system when I traded in the camper I set about rethinking my whole approach to solar for the Mini. Mention drilling holes into the roof of an RV and almost every RV owner will get squeamish, water leaks are one of the most common ways RV's get damaged and the first question a dealer considering an RV for a trade in asks is "Any water damage?" When I bought the camper it was already four years old and the previous owner had drilled all kinds of holes in the roof so me adding a few more wouldn't hurt much. With the Mini being brand new, and the roof being in pristine, "undrilled" condition I just couldn't bring myself to mounting solar panels on the roof. I had to come up with a completely new (for me) approach and I found it after research on the Internet and at the Quartzite RV show back in January. My old panels were made by Renogy and worked great, I stuck with them. 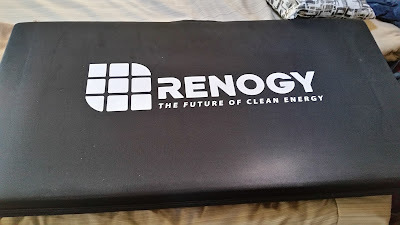 When I had stopped by the Renogy Solar booth at the Quartzite RV show they had a 100 watt solar "suitcase" set up that looked really well engineered. It stored in a nice padded case like mine above but I really had my heart set on at least a 200 watt system, like I used to have in the camper. The Renogy rep said they were going to come out with a 200 watt suitcase later in the year and just keep checking their EBAY website for it. I kept checking and finally towards the end of April was able to order it and have it sent to my sister's in Austin, knowing that she could bring it up to me in Arlington when we all met up for my daughter's graduation. The logistics all worked out great and I finally had a portable solar solution for the Mini. The "problem" was I had electrical hookups available to me almost all through May so I never had a reason to give the suitcase a tryout. (Nice problem to have!) Finally, towards the end of the month I pulled into a small town's city park in Oklahoma which was listed on the Internet as having RV campsites with electrical hookups, Unfortunately the park had been badly flooded in the spring and the power to the electrical boxes had yet to be restored so...out came my suitcase for the first time! 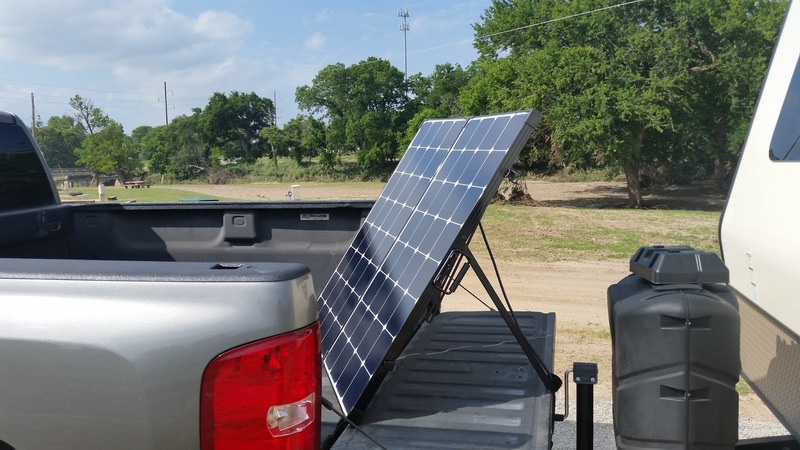 200 watts of solar goodness in the pickup's bed! The initial time setting the suitcase up was pretty smooth. The suitcase comes with it's own charge controller which is attached inside the back of one of the two panels. Renogy included a fairly long cable which attaches to the charge controller and then attaches to the Mini's battery with alligator clips. Adjustable struts allow you to get the panels perpendicular to the sun for optimum panel performance. These panels will produce better than the Tank's due to the tilt capability. When you're done using the suitcase the struts collapse into the back area of the solar panels, the cord loops up and fits in the inside of the panels, the panels fold in on their hinges to make the "suitcase", and two latches secure closure and it then fits into the zippered padded case for travel. It doesn't take five minutes to setup or take down. While having the fixed passive solar setup in the Tank was pretty effortless, because the panels couldn't tilt to the most favorable angle to the sun, often times, particularly in winter, the energy the Tank's panels produced was sometimes only 50% of their rated capacity. The Mini's suitcase should easily outproduce my old setup due to it's ability to aim and stay perpendicular to the sun. I guess we'll see!